Lyle: This lesson is designed to help you learn how to play rhythm guitar over a basic 12 bar blues progression. When talking about "the 12 bar blues", this means there are 12 bars, or measures in the total progression. There are 4 beats to a bar. By repeating this progression, you can add lyrics and solos. 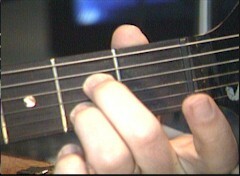 Lyle: Typically, the 12 bar blues is simply made up of 3 chords, the 1, 4, and 5 chord of whatever key you're in. There are many alternatives to this, but in this lesson you'll focus on the 1 - 4 - 5. 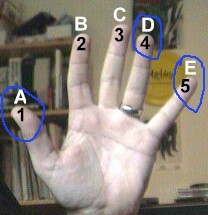 The 1 chord is the key chord, the 4 chord is the sub-dominant and the 5 chord is called the dominant. Don't worry if this is confusing you right now, just keep up with me and learn to play what I will be showing you. You can always come back and read this later when you might have a better idea what it is. Lyle: These 3 chords are perhaps the most important 3 chords of any and all songs. You'll find them used everywhere. A simple way to figure out what the 1-4-5 chords are in most keys is simply count on your fingers up the alphabet starting with 1 and the key you're in. Lyle: In the key of A, the 3 chords that make up the 1-4-5 are A, D and E. On any string you can go up 5 frets from the root to find the 4 chord, and 7 frets from the root to find the 5 chord. Let's take these 3 chords and turn them into dominant chords, or A7, D7 and E7. Dominant chords have a unique dissonance to them and work great as blues chords. 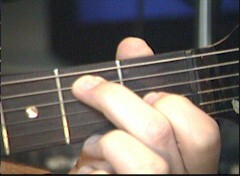 Lyle: Learn how to play these 3 chords. Make sure you're hearing all the notes clearly. 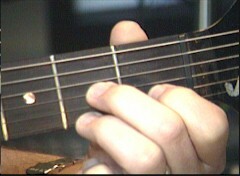 There are many ways to play these chords all over the neck with different fingerings and shapes. Lyle: These 3 versions are in what's called the open position because of the open strings involved. In the following lessons, you'll learn other ways to play these chords. You're now ready to put them in a basic 12 bar chord progression. Lyle: Be sure to listen to the next TAB file, it will help you to hear the chord being played against the groove. You'll just strum the chord once for each measure. Lyle: Once you have this down, try playing along to this jam track. It also has my voice in it calling out the chord changes. Lyle: Once you have the chord progression memorized, try playing along to this jam track without my voice. Lyle: Now you have just learned two different ways to play rhythm guitar to a 12 bar blues jam in A! Lyle: In the next lesson you'll learn more ways to play rhythm along to this same jam and even how to play blues solo riffs! Lyle: By the end of this 10 part series you'll be on your way to becoming a blues master! Lyle: As we go there will be other rhythm patterns that you will learn. Then you'll see how easy it can be to apply the new rhythm riffs to any jam in any key. Lyle: Make sure you can play both chord styles along to the whole 12 bar blues progression. Next lesson we'll have even more fun!